Continuing the “tradition” started for Tehran, here’s the list of Top Things to Do and See in Shiraz. This is the third "Top Things to Do and See in..." instalment for Iran after Tehran and Esfahan. The place offers a lesson or two on the history of civilisation from as long as 2500 years ago. A definite not-to-be-missed sight if you’re in Shiraz. It is located about a one-hour drive from Shiraz city centre but don’t let that hinder you from going. Located further away from Shiraz but not that far from Persepolis, Necropolis is worth visiting if you combine this out-of-town trip with Persepolis. Both archaeological sites should take you at least half a day. This 18th-century citadel look-a-like residence of Karim Khan who’s reputed to be one of the most just rulers in Iran history is worth visiting even if it is just for its hamam. Its location in the city centre makes it hard not to miss. Don’t be fooled by the subdued look from the outside of this late 19th-century masjid (mosque) complex. This masjid is unbelievably beautiful with its intricate and out of this world tile work. Quite a walk from the city centre but totally worth the trouble! If you’ve been to Masjid Nasir al Mulk above, and still have time, walk further down South East on Lotf Ali Road to this museum and check out the house as well as the garden. They are part of a UNESCO World Heritage site. This is one of the main attractions in Shiraz, and rightly so too! Its location in the city centre and right next to Vakil Bazaar gives everyone easy access to it. If you have the chance, try to visit the masjid at least once during daytime and another in the evening when it is all beautifully lit up. What’s a city without a main bazaar? This bazaar, originally established in the 11th century, is the place to walk around, strike a bargain, or just people watch. 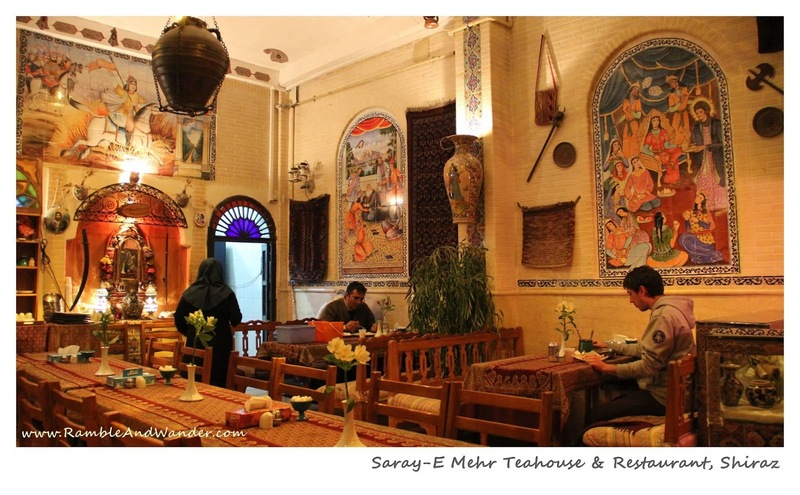 And while you’re there, try to find Saray-E Mehr Teahouse & Restaurant. Hidden in one of the mazes in the bazaar, it is one of the places usually recommended to visitors interested in trying local and traditional meals. The masjid is located near a busy road junction and possibly a couple of bazaars as well if I recall this correctly. The area is the place to people watch, complete with the beautiful dome in the background. Do go inside the masjid compound and prayer hall if possible because it’s just beautiful. Cameras, however, are not allowed inside, and you have to leave them with the security at the gate. Having said that, I did see a few people taking photos with their mobile phones. Hafez was a prominent Persian poet who lived in the 14th century. The tomb, however, is the product of early 20th century. Most locals visit the tomb to pay respect and take a stroll in the beautiful garden where the tomb is located in. What do you think of the list? Care to share with us your thoughts on the above places? And if you have been to Shiraz before, what other sights do you think are also a must see? Yg tu, hang kena pi sana sendirilah. Mintak AirAsia pi fly sana semula. Hi there, Fie-Nuts! Good to know that ;-) I personally believe that if we can know about Acropolis in Athens, then at least we should know about Persepolis in Iran too, and the connection between the two ancient cities. Unfortunately places in Iran, including Persepolis, are not widely promoted. I myself didn't know about Persepolis until I decided to go on a trip to Iran. That's why I try to cover each one of them here in individual posts. W'salam, Rush. Yup, after reading what you've done in Lebanon, I believe you should take the opportunity and go to Iran as well. Plenty of amazing places & friendly people. Been there back in 1999 via Umrah transit but I was a young school girl back then with family on a guided tour and didnt get to fully explore Tehran & Esfahan, so it's a must (re)visit in my list. By the way, I didn't know there's an umrah and ziarah package that covers Iran as well. Did you guys fly with Iran Air or with another airlines? Thanks for the compliment :-) How did you find Shiraz, Tehran & Esfahan? Did you like them?